Who was Major General Joseph Wheeler? Several months ago, I received an email from my friend, Kenneth Knittel, telling me about a very cool event that was going on in September. 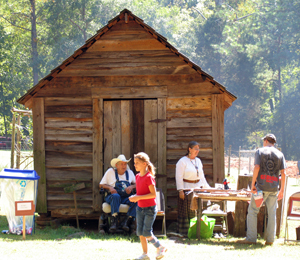 Kenneth and his wife, Mylinda, are renowned professional photographers and he was officially taking part in the William Harris Family Homestead “Heritage Day Festival”. This is an event the family does every other year in order to help fund and operate the homestead that has been in the Harris family since 1836. 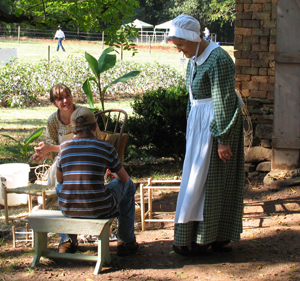 The homestead was established eleven years earlier in 1825 and is composed of 500 acres. It was a working farm well into the Twentieth Century. 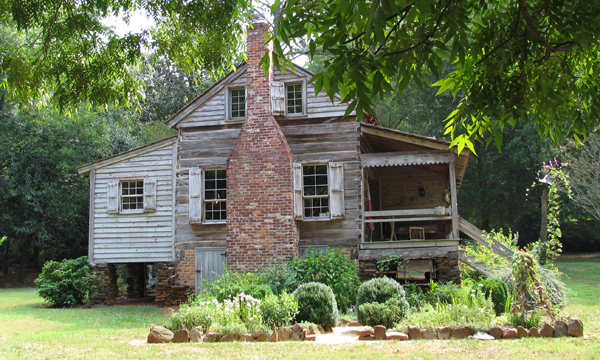 In order to benefit from certain tax loopholes, the family came together and formed the “William Harris Homestead Foundation” to preserve and maintain the entire homestead. I cannot imagine how much it takes to manage the homestead on a yearly basis, but I would venture a guess of several tens of thousands of dollars. 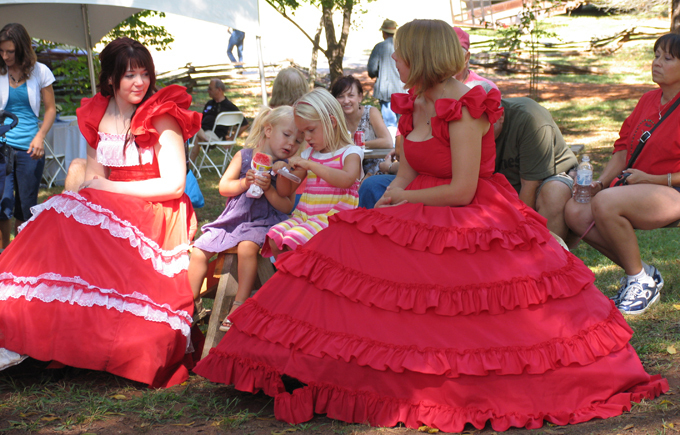 Every other year, the family holds a “Heritage Festival” where people are invited to come to the homestead to see and experience some of the things that went on at the homestead during the Nineteenth Century. With this being the Sesquicentennial of The Civil War, an added emphasis was placed on their Confederate Ancestors. I took the initiative to contact Mrs. Dotty Zozworsky, the Director of the Harris Foundation to see if there was some part Camp Wheeler could participate in their event. In short order, I got a very enthusiastic letter back from Dotty telling me she was thrilled to hear from us. I then talked to our Commander, Joe and we soon were making plans for the camp to take part in the event. Joe and I went up to meet with Judy Hardegree (pictured right) at the homestead. When we arrived there, we were blown away by the immaculate and pristinely maintained farm house and property. Judy explained to us that she planned to place a “Memorial Area” to honor the Confederate Harris’ Ancestors and she wanted us to have our presence right there next to it so we could talk to visitors about The War. Elsewhere, there would be a Confederate Encampment to show visitors a sampling of army life, well at least towards the beginning of The War on a good day. When we left, Joe and I were extremely enthusiastic and felt it was a great honor to serve the family as we were going to do. 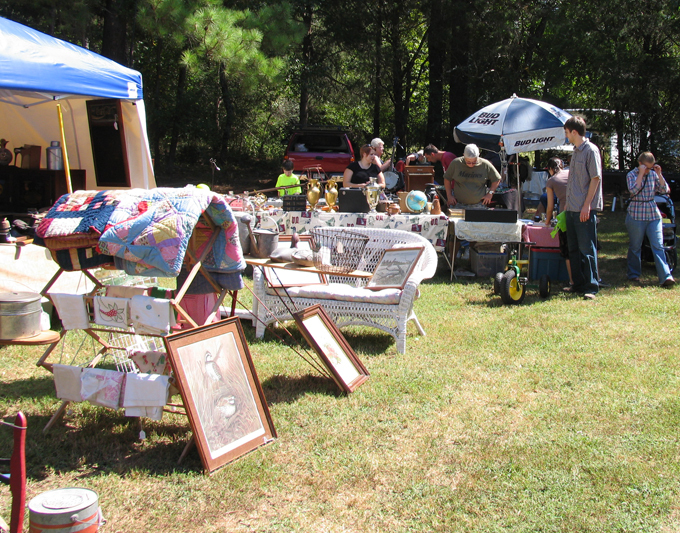 When the big day arrived, Camp Wheeler members arrived about 90 minutes early to set up our camp booth. 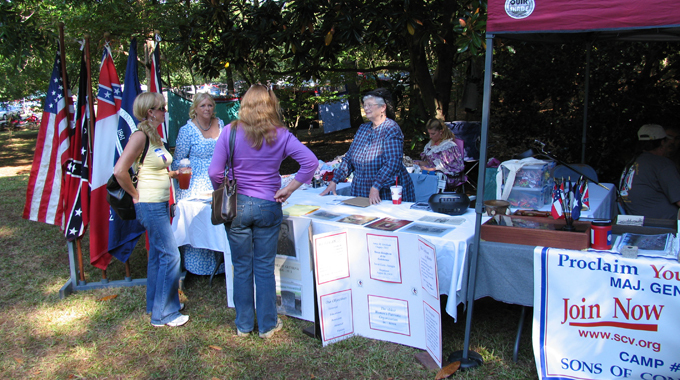 Next to it was a booth for the James M. Gresham Chapter of the United Daughters of the Confederacy. 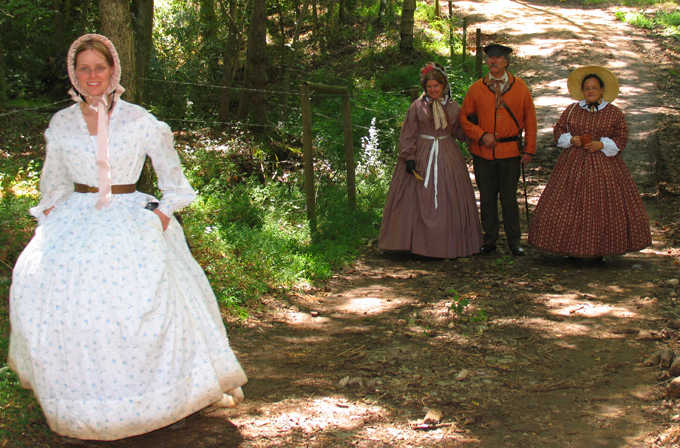 The ladies came out dressed in period garments and it made for a very fine site. 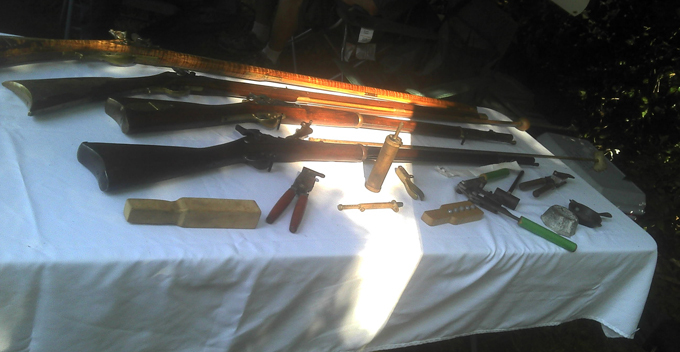 At our booth, our members brought out some of their Civil War relics. 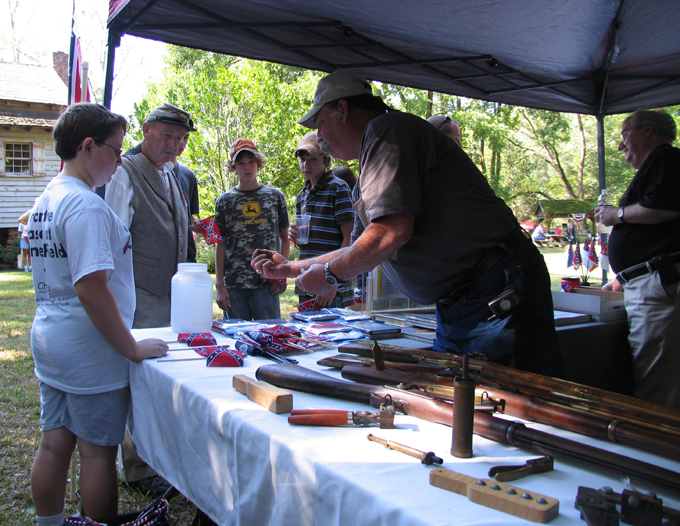 Jerry New brought out four of his rifles and that really caught the eye of a lot of children. Don Stark was our only member that came out in period costume. The rest of us were wearing our new Camp T-Shirts and it was a very cool site to behold. Don and the rest of us eagerly spoke to all the passer-bys that was interested about the Confederacy and the SCV. 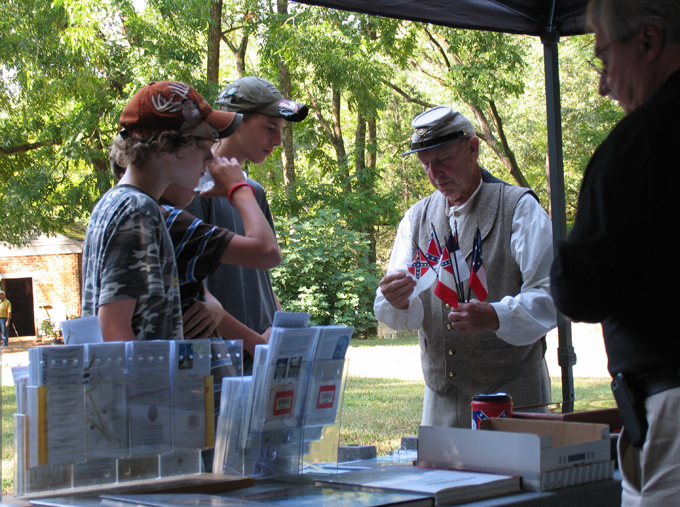 Gene Wade spoke to a number of people about joining the SCV and offered to help with establishing their genealogy connection to their Confederate ancestors. I was surprised and very pleased to see quite a number of young people come up to talk about the Confederacy and I was impressed with several of them that had a pretty good knowledge of their ancestry. 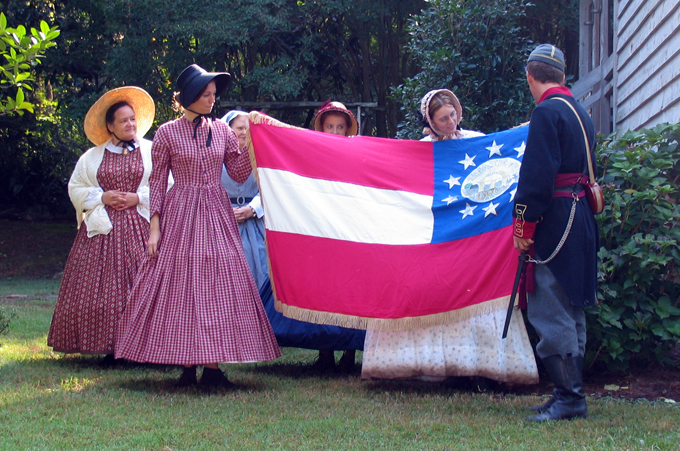 While the event started at 9am, the first official event was the presentation of a replica Confederate flag hand made by Ms.Lois Forester (pictured on the right) to the Athens-based re-enactment group, The Armory Guards. I was told she made the flag all on her own. She hand-dyed the silk and the flag emblem was hand-painted by her as well. The Guards established an encampment on the far side of the property. 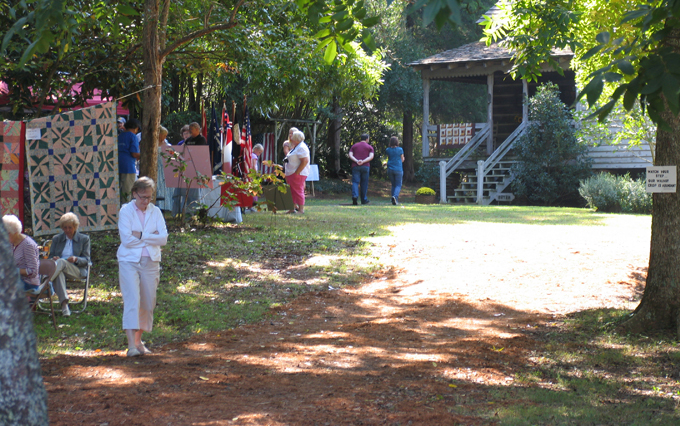 The Ms. Forester and her lady friends presented the handmade flag to the volunteers in front of the farm house. From there it was to the middle of the property where the re-enactors were waiting for it. Once it was mounted on a flag pole, they marched to the encampment site. I got to walk around two or three times to see what was going on around the Homestead. There were activities being held everywhere on the property and there were people all over the place. 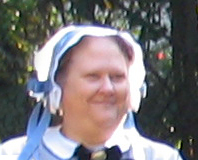 I was really pleased to see a large number of women that dressed up in period dress. 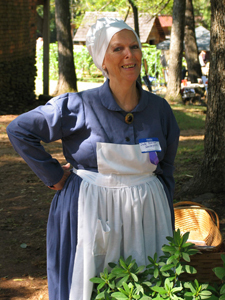 While there were a few men in period costumes, I’d say there were ten times the number women dressed for the occasion. Sitting and watching the ladies go by made me appreciate the grace and simple elegance of women in the Nineteenth Century. Even the ladies dressed in simple farm dresses, it had a certain elegance and beauty all of its own. Whether they were young or old, all were simply beautiful. The whole day was fairly relaxed with people coming and going by our booth and the Memorial Area. 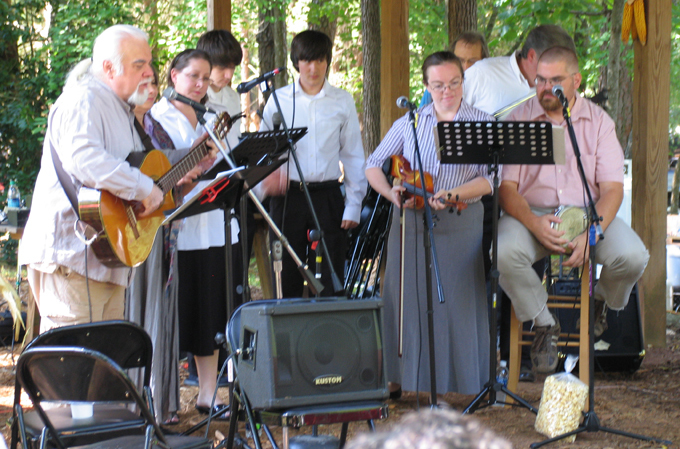 We were not too far away from the homestead's pavillion where live music serenaded us throughout the day. To the right of the pavillion were food vendors and on the other side of the house from us was an antiques flea market area with vendors from all over the region. Beyond the pavillion were the various farm buildings and each one had something of interest for the visitors to see. Towards the end of the event, Judy told me that over 900 people participated in the event. The previous event had brought in 750, so this was a good increase, especially in this economy. At the end of the day I think we did an superb job of representing the Confederate Cause, Camp Wheeler, and the SCV at large. It was a truly fantastic day to be representing the SCV and The Cause. Everyone had a really great time. Something I got a kick out of was over the summer, I took in a new roommate, Mark Carrier (pictured left with passengers), who had grown up in Conneticut. He has had very little exposure to what I call "The Southern Way" and I had tried to explain to him before the event how we as Southerners treat each other and expect to be treated. 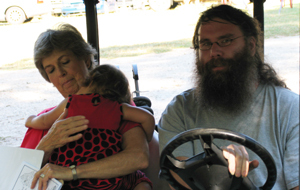 As the event drew near, He gladly volunteered to help out at the event and Judy put him to work driving a golf cart to bring people to and from their cars that had to be parked quite far away. At one point, Mark took a break and came to our booth. He sat down and said: "Every single person here is so pleasant! They say hello, please, and thank you, AND THEY MEAN IT!!! It's not Natural!!!!! They never do that back at home!" I told him: Its not natural for you Yankees, but its how we do things here in the South! Now you know why we are trying to hold on to these old ways! Memorial Area in the foreground, SCV and UDC tables to the right. 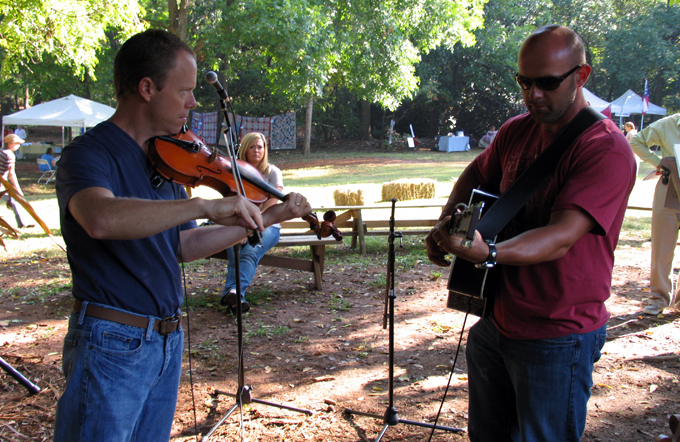 I want to thank those that participated in the Harris Homestead Foundation’s Heritage Day event “A Call to Arms” on Saturday September 24, 2011. 1st Lt. Commander Tommy Cook, 2nd Lt. Commander Jerry New, Adjutant Steve Camp, Chaplin John Maxey, Web Master Hal Doby, Genealogist Gene Wade and Compatriot Don Stark all participated in various ways to make our day a success. Jerry New demonstrating how Confederate Soldiers made their bullets. Our members impressed the young people with their knowledge of their Confederate heritage and I was excited to see their interest. I truly hope they pursue expanding their knowledge by joining a camp somewhere. We have several leads which we will follow up on and hopefully we will be successful in expanding our ranks from our efforts at this event. We did receive donations of about $90.00 from the sale of flags and other memorabilia. As we agreed to at our September membership meeting, we donated ten percent of the money we took in to the Harris Homestead Foundation to thank them for allowing us to participate in their festival. Thanks also to Madelyn Stark and the ladies of the James M. Gresham Chapter of the United Daughters of the Confederacy for joining us. Their presence doubled the size of our booth and made it most impressive. I also need to thank Ms. Dottie Zazworsky, Mrs. Judy Hardegree and The William Harris Homestead Foundation, Inc. for their hospitality and the opportunity to participate in this event. It is our hope that we are invited back to participate in next years event. At our August Meeting, we were joined by Richard Straut, the 1st Lt. Commander of the Memorial Camp #1432 in Stone Mountain. 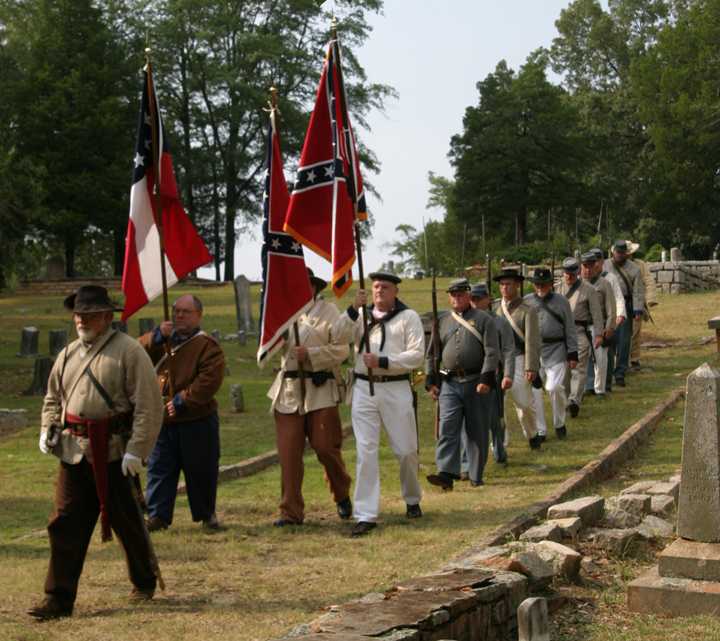 Over the past few years, they have been working on the restoration of the Confederate Civil War section of the Stone Mountain Cemetery. 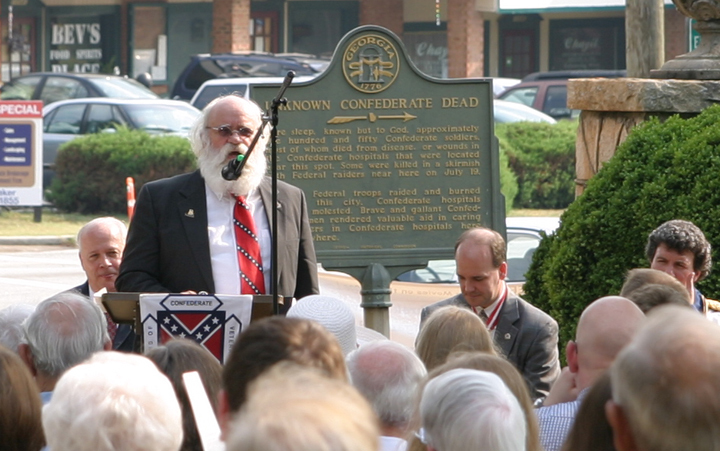 Using funds from the Georgia State SCV car tag program, they had set in place around 250 new headstones at the resting places of Confederate Soldiers whose names are unknown. They have also erected a new large flagpole at the site of these unknown fallen heroes. Richard joined us that evening to invite us to attend their dedication ceremony to commemorate the completion of their hard work on Saturday, August 20th. Camp Joe Wheeler Adjutant, Steve Camp and myself (Web Master Hal Doby) were in attendance for the dedication ceremony. I am very pleased to report that their event was very well attended> There were more people there than the number of chairs they had brought out. In attendance, they had representatives from the Battalion, Division, and SCV Headquarters in attendance, as well as Pat Wheeler, the Major of the City of Stone Mountain. Prior to the event, the day had turned gloomy and rainy, but just prior to the event, the weather took a turn for the better and the Sun came out to join in the celebration. The featured guest speaker, Dr. Brent Griffin, gave a rousing oration that harkened back to famous orations that took place around the Civil War period. With a mighty voice, he was able to be heard loud and clear without the aid of the camp's speaker system. Congratulations to Memorial Camp for not only a great dedication ceremony, but to their hard work to improve the Stone Mountain Cemetery! Copright 2011 Major General Joseph Wheeler SCV Encampment #863, All rights reserved. This site was created using Adobe Dreamweaver and should be suitable for viewing on all web browsers. Please Note: Portions of the content presented here require Adobe Acrobat/Reader, Adobe Flash Plug-in, and Java in order to properly function as intended.